Nicole's Homemade Treats: Foodie Friday! of days! It has been crazy around here!! I decided to change it up a bit! I am doing a foodie post today!! What is foodie you say? I am definitely a foodie! If you would like more information on foodies, then you should go to Wikipedia. I do not know how many of you are familiar with Zingermans, but they are one of my favorites! I can spend hours in Zingerman's when I am visiting Ann Arbor, Michigan!! I do spend alot of time looking at their site and drooling! I purchase this for all my family/friends who have had babies!! What scares the living daylights out of some people just happened to friends of yours: they had a baby. They don’t sleep. How on earth do they eat? Very well, if they’re lucky enough to have friend who sends this. The Midnight Feeding Gift Box is filled with a nosher-sized Sourcream Coffeecake and Two Magic Brownies, Gummis, Sweet Tortas, Koeze Cream-Nut Peanut Butter, Antonio Mattei Biscotti, a small jar each of Preserves and Italian Honey, and a darn cute Bib with a Zingerman’s patch on it. I order one of these on a regulars basis!! 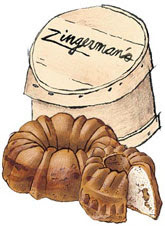 This is a Zingerman’s classic and perennially our most popular gift: rich, moist Sourcream Coffeecake loaded with Indonesian cinnamon and toasted walnuts, baked in a traditional bundt pan. It’s very impressive and extremely delicious. And it lasts. In theory, a week or two after delivery, wrapped, it’ll still be soft and scrumptious, melting in the mouths of a hungry office staff. Personally, I've never seen one withstand the onslaught of the hungry for more than an hour. Gift boxed versions are packed with tissue in our handsome wooden ZingCrate, illustrated at right. You can also buy the nosher cake in our printed cardboard box. Nosher serves 5-7. The Fresser can feed 10-12. We’ve been selling this kit at our Creamery in Ann Arbor for a while now and folks have been, well, eating it up. Easy to follow instructions make it a great gift for kids, cheese lovers and families that cook together. 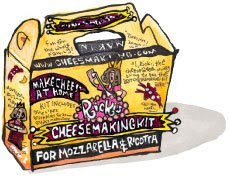 Every box comes with rennet and citric acid — enough for 48 batches of cheese — as well as instructions on how to make your own mozzarella or ricotta from scratch. All you need to provide is milk and salt. It takes less than an hour to turn the milk into cheese. Well I hope you are able to enjoy these great item from Zingerman's as much as I do! I have used the Easy Mozzarella kit. I ordered it awhile back directly from the woman who makes the kit (www.cheesemaking.com). In fact, she lives in Massachusetts and I'd love to take one of her classes some day. ooooh, that cheese making kit is tempting!!! I want to make cheese! That cheese kit is awesome! That would be a fun kids project too! Thanks Nicole!